San Francisco: Ford’s Focus has been helping the corporation’s bottom line by offering interesting and economical motoring at the bottom of the company’s product line. Originally designed as a European car with worldwide applications, the Focus is built for Americans at Hermosillo, Mexico, or Wayne, Michigan. Despite intense competition in the compact sedan field, the Focus has been a favorite of the motoring press because of its highly competent handling and decent power. Sadly for the auto buff books, the 170-horsepower SVT model is no more, but the ST steps into the role. Despite a lower horsepower rating, it turns out more torque than the SVT, and it has plenty of energy for car enthusiasts on a budget. 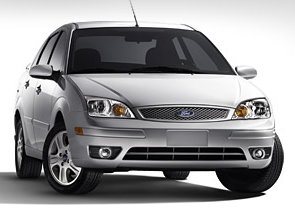 For 2005, the New Edge styling cues, so avant-garde in 2000, have been edited out of the design template. The front end takes on a taller, more conventional look, with the de rigueur multi-lens headlamps and a more prominent grille with a mesh that resembles that of the new Five Hundred full size sedan. You’ll have to look at the tail end to see any other outside changes. The taillamps are more strait-edged, and the playful slices that were part of the short-lived New Edge philosophy are as gone as the 20th century. Whether this is an improvement or just a revision is your call. The new look is appropriate for the market segment, which includes cars like the Honda Civic and Volkswagen Jetta, neither of which relies on extreme styling to sell vehicles. It’s the interior that gets the lion’s share of the changes for 2005. The wild swooshes on the dash are now tamed, and Ford has made an effort to provide (and to mention) the upgraded plastic that they have used there. Everything is easy to find and operate, which is all you really need from a car in this market segment. The seats feel comfortable, at least they did for the hour at a time I sat in the driver’s chair. The manual five-speed was rewarding to shift, and although some road noise found its way inside, it was not intrusive. I still wonder at Ford’s noisy and reverse-logic lock buttons, which pop out when the door is locked and sit flush when it’s unlocked. There are two different sizes of cup holders in the center console and more holders in the doors, presumably for drivers who want to be two-fisted drinkers (no alcohol, please!). You can buy a Focus in four series starting with S and running upward through SE, SES, and ST. Match those models with four shapes, the three-door ZX3, four-door ZX4, five-door ZX5 (Notice the pattern? It’s about to be broken. ), and the ZXW wagon. The ST comes only as a four-door sedan with a five-speed manual, being the sporting type; there is no S model wagon. Even the most basic S model gets things like an AM/FM stereo with single CD player and fifteen-inch wheels. But you need to step up to the SE, likely the most popular model, to get the power windows, locks and mirrors that most people prefer, plus keyless entry, air conditioning, and variable speed wipers. The SES brings in alloy wheels, which perk up the looks of the car substantially. You also get a tauter suspension with a rear-stabilizer bar, six slots for your CDs, cruise control, fog lamps, and a leather steering wheel to increase your sense of well being. The ST is the top and, naturally, most expensive choice. The biggest advantage is the engine. The standard powerplant for other models is the new 2.0-liter, 136-horsepower inline four, which replaces the previous 130-horsepower engine, as well as last year’s base model 110-horsepower unit. The ST gets a 2.3-liter 151 horsepower four, which has a specially tuned exhaust (for sound and for air flow). If you live in California (or in one of the four eastern states that subscribe to our strict emission statutes) you can get a super clean engine that makes your Focus into a PZEV - Partial Zero Emissions Vehicle. My CD Silver Clearcoat Metallic tester had a rear spoiler for an extra jaunty appearance, as well as tinted glass and a chrome exhaust tip. Inside, I got leather sport bucket seats ($695) for fun and side impact airbags ($350) for safety, and those seats were heated ($115) too. Anti-lock brakes with traction control were installed to help avoid crashes in the first place. The secret of getting the most grins out of this kind of car is to run the revs up high, where the engine can really pull. I did that seldom, being a good citizen, but when I did, the car took off with vigor. Despite its sporting intentions, the Focus ST is rated at 23 city, 32 highway on the US Government’s fuel economy test cycle (your mileage may vary).